For other uses, see Jiangnan (disambiguation). 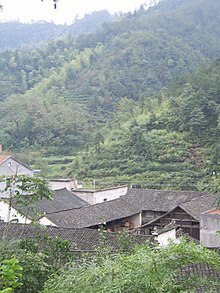 Jiangnan or Jiang Nan (Chinese: 江南; pinyin: Jiāngnán; Wu: Kaon平 noe去; formerly romanized Kiang-nan, literally "South of the river") is a geographic area in China referring to lands immediately to the south of the lower reaches of the Yangtze River, including the southern part of its delta. The region encompasses the city of Shanghai, the southern part of Jiangsu Province, the entire Zhejiang Province, the southeastern part of Anhui Province, the northern part of Jiangxi and Fujian Provinces. The most important cities in the area are Shanghai, Anqing, Changzhou, Hangzhou, Nanjing, Ningbo, Shaoxing, Suzhou, Wuxi, Zhenjiang and Fuzhou. Jiangnan has long been regarded as one of the most prosperous regions in China due to its wealth in natural resources and very high human development. Most People of the region speak Jiangnan Mandarin and Wu Chinese dialects as their native languages. The word Jiangnan is based on the Chinese name for the Yangtze, Cháng Jiāng, and nán meaning "south." In the 19th century, English speakers also called it Keang-nan. The earliest archaeological evidences were of the Majiabang and of the Hemudu cultures. The later Liangzhu culture, from around 2600-2000 BC, created complex and beautiful jade artifacts. Their economy was based on rice cultivation, fishing and constructed houses on stilts over rivers or lakes. 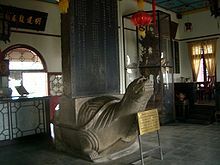 During the Zhou dynasty, the Wu and Baiyue peoples inhabited the area with heavy aquaculture and stilt houses, but became increasingly sinicized through contact with northern Chinese states. They adopted the Chinese writing system and created excellent bronze swords. The Chu state from the west (in Hubei) expanded into this area and defeated the Yue state. After Chu was conquered by the Qin state, China was unified. 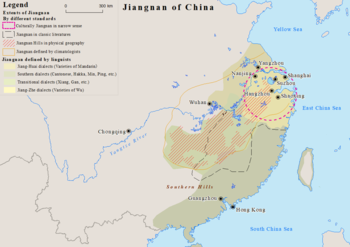 It was not until the fall of the Western Jin dynasty during the early 4th century AD that northern Chinese moved to Jiangnan in significant numbers. The Yellow River valley was becoming barren due to flooding (lack of trees after intensive logging to create farmland) and constant harassment and invasion by the Wu Hu nomads. Although Chinese civilization originated in the North China Plain around the Yellow River, natural climate change and continuous harassment from nomadic enemies damaged North China's agricultural productivity throughout the 1st millennium AD. Many people settled in South China, where the Jiangnan area's warm and wet climate were ideal for supporting agriculture and allowed highly sophisticated cities to arise. As early as the Eastern Han dynasty (circa 2nd century AD), Jiangnan areas became one of the more economically prominent areas of China. Other than rice, Jiangnan produced highly profitable trade products such as tea, silk, and celadon porcelain (from Shangyu). Convenient transportation – the Grand Canal to the north, the Yangtze River to the west, and seaports such as Yangzhou – contributed greatly to local trade and also trade between ancient China and other nations. Several Chinese dynasties were based in Jiangnan. After the Qin Dynasty fell, the insurgent state of Chu took control. Its ruler, Xiang Yu, was born here. During the Three Kingdoms period, Jianye (present-day Nanjing) was the capital of Eastern Wu. In the 3rd century, many northern Chinese moved here after nomadic groups controlled the north. In the 10th century, Wuyue was a small coastal kingdom founded by Qian Liu who made a lasting cultural impact on Jiangnan and its people to this day. After the Jurchen completely overran northern China in the Jin–Song war of the 1120s, the exiled Song dynasty government retreated south, establishing the new Southern Song capital at Hangzhou in 1127. During the last years of the Yuan dynasty, Jiangnan was fought for by two major rebel states: Zhu Yuanzhang's Ming faction, based in Nanjing, and the Suzhou-centered Wu faction led by Zhang Shicheng. A ten-year rivalry ended with Zhu's capture of Suzhou in 1367; having thus reunified Jiangnan, Zhu proclaimed himself the first emperor of the Ming dynasty on Chinese New Year's Day (20 January) of 1368, and a few month later expelled the Mongols from Northern China as well. Nanjing remained the capital of the Ming dynasty until the early 15th century, when the third Ming ruler, the Yongle Emperor, moved the capital to Beijing. When the Qing dynasty first took over China, Jiangnan's gentry offered resistance in the form of denying the ability to deal with taxes to the government. The Qianlong Emperor of the Qing dynasty made many visits to Jiangnan (Chinese: 乾隆下江南; pinyin: Qiánlóng Xià Jiāngnán), which have been the popular subject of numerous Chinese operas and television dramas. Earlier, the Kangxi Emperor visited the region as well. During the 19th century Taiping Rebellion, the regime established by the Taiping rebels occupied much of Jiangnan and eventually made Nanjing its capital. The area suffered much damage as the rebellion was quelled and Qing imperial rule restored. After the fall of the Qing dynasty in 1911, and Chiang Kai-shek's Northern Expedition, the Republic of China (ROC), following the wishes of Sun Yat-sen, made Nanjing the national capital. From the late 1920s until the Second World War, the Jiangnan area was the focus of Chinese economic development. Much of the Kuomintang's ruling elite and the ROC's economic elite hailed from the Jiangnan area. Dialect has also been used as a tool for regional identity and politics in the Jiangbei and Jiangnan regions. While the city of Yangzhou was a flourishing and prosperous center of trade, it was considered part of Jiangnan (south of the river), which was known to be wealthy, even though Yangzhou was north of the Yangtze river. Once Yangzhou's wealth and prosperity began to wane, it was then considered to be part of Jiangbei, the "backwater". After Yangzhou was removed from Jiangnan, its residents decided to replace Jianghuai Mandarin, which was the dialect of Yangzhou, with Taihu Wu dialects. In Jiangnan itself, multiple subdialects of Wu fought for the position of prestige dialect. Hangzhou – historic capital of the Song dynasty. Nanjing – historical capital of China for various periods in history. Nantong – a prefecture-level city in Jiangsu province, China. Ningbo – a sub-provincial city in northeast Zhejiang province. Shanghai – One of the most important financial and economic centers of China. Suzhou – famous for its canals and beautiful architecture such as temples and gardens. Wenzhou – a city in southeastern Zhejiang province. Wuxi – Near Suzhou, famous for its beautiful sights of the Tai Lake (one of five biggest freshwater lakes in China) and culture. The birthplace of Chinese national industry. Historically, Jiangnan exported silk and green tea. ^ a b Roberts, Edmund (1837). Embassy to the Eastern Courts of Cochin-China, Siam, and Muscat. New York: Harper & Brothers. p. 122.